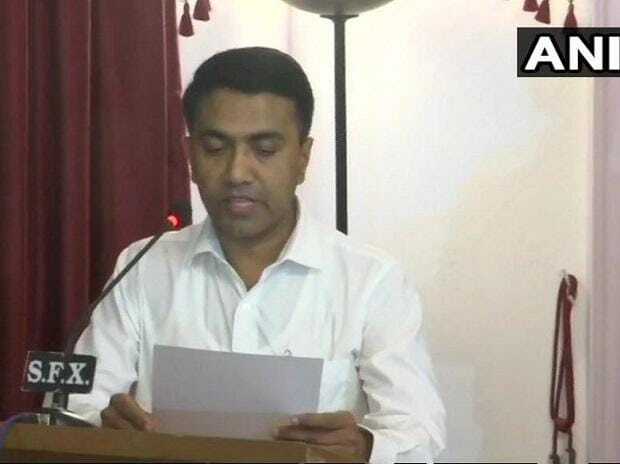 Goa Assembly speaker Pramod Sawant was on Tuesday sworn in as the state's new chief minister. Sawant, 45, is a BJP leader. He will succeed Manohar Parrikar, who died on Sunday after battling pancreatic cancer and was cremated with state honours in Panjim Monday evening. He was 63. Goa Forward Party chief Vijai Sardesai and Maharashtrawadi Gomantak Party MLA Sudin Dhavalikar were sworn in as the state's deputy CMs in the coalition government. There was no such arrangement (Dy CM post) in place when Parrikar was the chief minister. "We have managed to convince the alliance partners and finalised the formula of two deputy chief ministers for the state," a senior BJP functionary told PTI. At present, Congress is the single largest party in the state with 14 MLAs. The BJP has 12 legislators in the 40-member Assembly, whose strength now is 36 after Parrikar's death.